Looking at making up some long line traces for use from the yak. The standard size are way too long for the limited space I have to work with so DIY is the way to go. Used some googlefoo and found out how to tie the knots for the hooks, next issue what size line to use? Will use PVC pipe as a trace rack with some small notches and some pool noodle in the middle for floatation. Keen to see what you come up with, I have been thinking of setting up a compact long line for my kayak too. 1 quarter to 1 third breaking strain of the backbone ie 60lb backbone then 15 to 20lb for trace with a max of 40lb trace for safety and if you are unlucky enough to catch a shark and not get bitten off it shouldn't take too much to rub the trace against the shark to break it off. I have a long line we used to set from shore with a large plastic bag it was 200lb backbone with 60lb traces would not use that from a yak as a big fish or several reasonable ones would tow you all over the place. I use old 50lb game nylon. 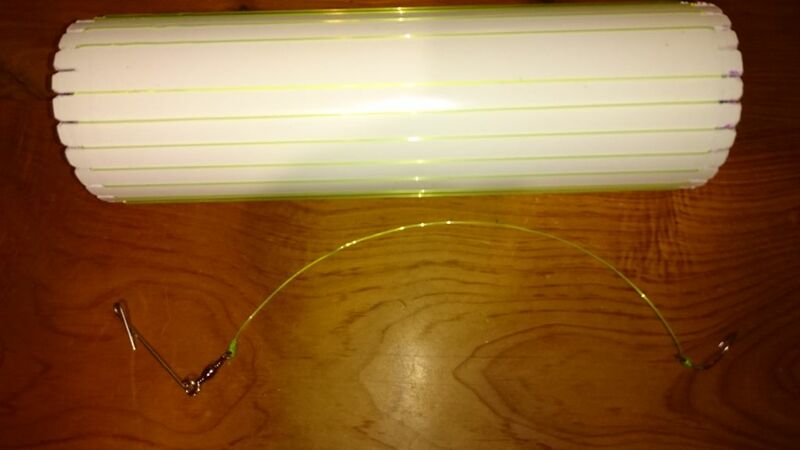 Its ok but I also thread a 3" section of very thin diameter pvc clear tube down onto the hook. This stops Mr snapr from wearing it through. Soeyimes I also thread a small piece of polystyrene just above the tube as an attractant and to float the hook above the crabs. If I may suggest these hooks in the largest size you can get. buy direct from their website tho. The wire appendage helps prevent them swallowing the hook, large size hooks are just better in every way even an 9/0 will still catch undersize fish no problem but are easier to bait and remove hooks and once again less chance of it being swallowed....Ive got 6s 7s and 8s and prefer the 7s and 8s but they havent been able to supply the bigger hooks for a while or at least not with the appendage. I use a "supple" or "tough" trace from black majic in 40-80p....80p is overkill but can handle some chaffing without needing to be replaced all the time. gadgetman, stingray and mikee like this. Gave trace tying a first go. Can't buy anything useful in a kayak friendly sized. 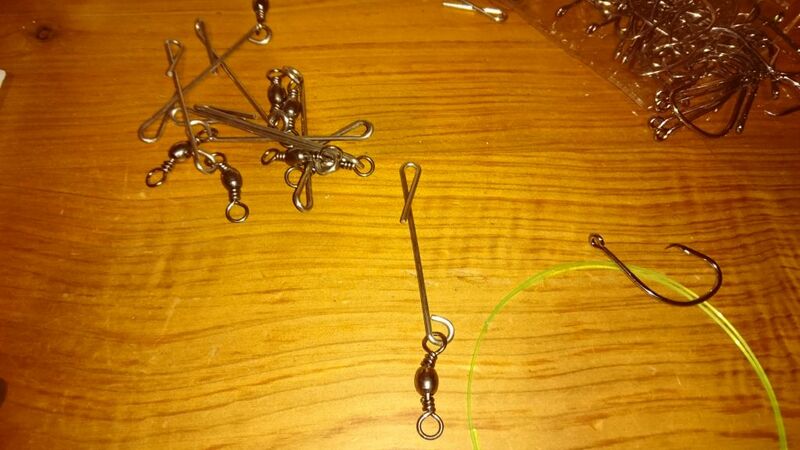 Found a hundred 5/0 circle hooks languishing in a box, bought on a clearance special. Bought a hundred long line clips to go with then, figured they'd disappear over time and might as well share the freight with myself. The odd couple a little loose, another odd couple a little tight but mostly spot on. Reasonably happy for a first effort. The trace rack is some 80mm PVC downpipe cut to 260mm with 8mm deep slits (roughly). veitnamcam, stingray, mikee and 5 others like this. What sort of dropper length should I use? When living near Waihi Beach (sandy bottom) we used the following longline bits. (A) 450 -500mm galvanised chain as an anchor as easy to recover. It was clipped to backbone and dropper line via small ‘shark clips’. (B) Backbone was commercial stuff, cut to approx 50m so one hook every two stoppers. This prevented tangling of traces. (C) Traces were snooded on like your hooks. We used the square jawed commercial type (name forgotten, but think it started with letter W). Traces were 15Kg weight (Kingis) and about the width of a bread crate as we used that for our trace holder. (D) Flag was bright orange AND black. It was pop riveted to about 1500mm of plastic conduit, that was fed through a cottonreel type polystyrene buoy. Chain was attached to the protruding conduit under the buoy to hold the flagpole vertical in wind. (E) Recovery reel was an electric fence one. It was held on knees by crew as I pulled in line and undid fish. When out alone, I fitted the reel to a rodholder via suitable broom handle offcut. (F) The line was set and recovered after 40-45 minutes only. This system slayed hundreds of fish. for a yak rig I would have them 450mm to 500mm for ease of use. if you use a frame for holding traces instead of the pipe you can prebait before you leave home or have seen a couple where the guys where using like a plastic crate with the hooks around the sides and the backbone was just dropped into the crate on retrieval with any droppers with fish on where removed off the backbone. just means that you have to pull the backbone out when you get home to put the droppers back on. one of those small folding crates might work mounted on your ply lid then you could just fold down once line was set. also you can have a small piece of line run along the side of your yak to clip any droppers onto that have a fish on so you can fully retrieve the long line before you have to deal to any caught just have it on the other side from where you pull in the line. 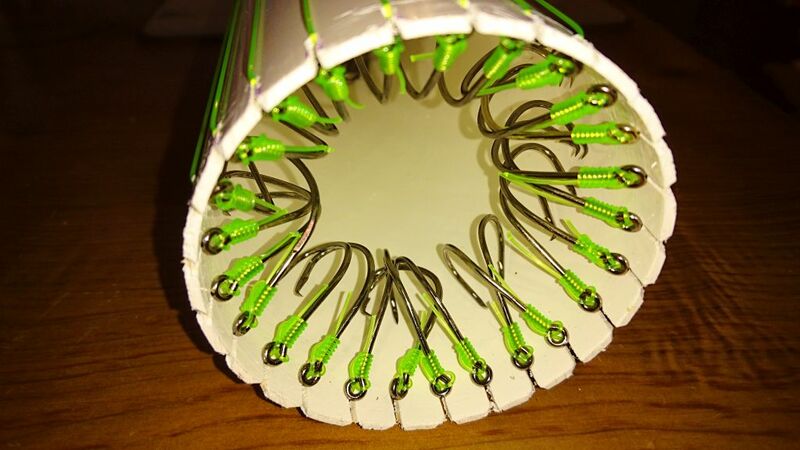 Maybe add a fluro bead above the hook, seems to help. An attractant. I thought the clear tube over the line was to stop the trace wrapping around the backbone..... I dunno. Main reason for tube seems to be to stop fish chomping through the trace.